Company becomes the first producer to meet new CA standards for LED bulbs. In order to encourage wider adoption of LEDs, California regulators recently put in place a voluntary standard to make bulbs more closely resemble the warm white light from traditional incandescents. 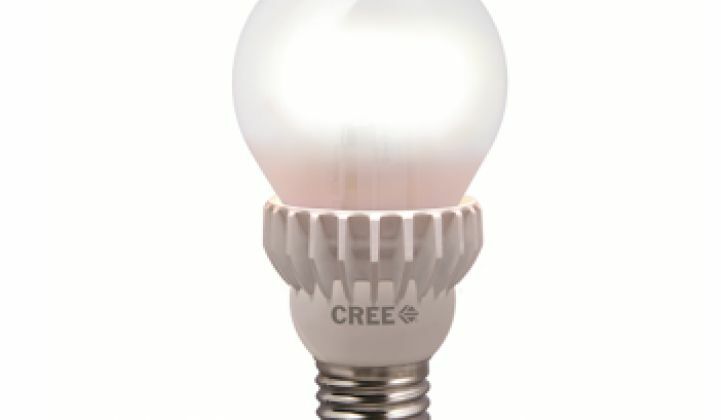 LED manufacturer Cree said this week it had become the first company to meet the standard, producing a bulb with a color rendering index (CRI) of 93 -- coming close to the quality of light from a 60-watt incandescent. A CRI score of 100 is the closest to natural light that a bulb can get. The bulb is being sold in Home Depot stories for $19.97. With a rebate from utilities, the price can drop to roughly $10. The Sacramento Municipal Utility District said this week it would be the first to offer a rebate for Cree's new LED. In 2012, Cree supplied LEDs for the Insignia series of bulbs manufactured by Best Buy to replace 40-watt and 60-watt incandescents. The product was designed to look exactly like a traditional bulb and radiate light in the same way. And earlier this year, Cree announced that its own 40-watt replacement bulb would retail at Home Depot for less than $10, breaking an important price point for LEDs. The latest design, called the TrueWhite series, was designed to meet California's voluntary standards for light quality. Like its other bulbs, the TrueWhite has a ten-year warranty. Although Cree has been producing LEDs since the '80s, it is a relatively new entrant to the consumer lighting sector. The company has focused on high manufacturing output, grabbing a 10 percent market share of the global market since 2008. As it works to furiously bring down the cost of producing LEDs, Cree is also working to take retail shelf space away from historical lighting leaders such as Philips, GE and Osram. Becoming the first company to surpass California's standards will likely help it continue grabbing new shelf space for its bulbs in growing markets. Recognizing the importance of dropping below the $10-per-bulb threshold, manufacturers are working furiously to stimulate customer demand, while also focusing on R&D. As a result, LEDs are expected to make up one quarter of all demand for new lighting by next year, and possibly 80 percent by 2020. In addition, the cost of producing an LED compared to the bill of materials is dropping by about 25 percent each year as production volume increases. In other news, Cree announced this week that it would entirely retrofit NASA's 600,000-square-foot headquarters in Washington, D.C. with its LED fixtures.